One of the key target markets for 5G deployments is ‘the last mile of copper’ from the local cabinet to the home. In order to avoid churning up streets to create fiber to the home, Qualcomm has repeated its intention to replace that last connection with some form of wireless, namely 5G. This requires each property to own a 5G hotspot that connects to the mast, and convert that signal either to Ethernet or local Wi-Fi. In order to do this, Qualcomm is creating a 5G home broadband reference design for its customers to take and productize. On one side of the hardware is a Qualcomm 5G modem, while on the wired side is Aquantia’s AQtion Multi-Gig Ethernet solution. The rise of high-speed home broadband has stalled in recent quarters. There have been attempts by big companies to deploy gigabit fiber to the home, or local residents associations can do it themselves, but in many cases, there hasn’t been enough penetration, especially in suburban environments. The main issue is digging up the road and invading public infrastructure to do so, as well as the overall cost. One of the ways around that is to replace that final connection to the home with something a bit more easily deployed, and potentially cheaper and faster at the same time. 5G comes in two forms: Sub 6 GHz, and mmWave. While mmWave is designed for dense urban environments with lots of traffic, sub 6 GHz is going to be the prevailing 5G technology for carriers that want to cover the widespread areas of most modern cities and towns, both for smartphone connections and if Qualcomm’s ideas are realised, home broadband (also known as ‘Fixed Wireless Access Equipment’). Ideally the technology will allow for >1 Gigabit speeds per installation, which would also mean that wired/wireless connections on the other side also need >1 Gigabit connectivity, such as multi-gigabit Ethernet (using Aquantia), or Wi-Fi 6 installations. Qualcomm’s reference design, capable of both Sub 6 GHz and mmWave, is set to be adopted by OEMs and carriers in Japan and Korea first, given the fact that their carriers are very quick adopters of new technologies, with Qualcomm’s customers expected to roll out their devices in 2020 for the US and European markets. This is highly contingent on how effective suburban deployments of 5G proceed, and which technologies are in play. 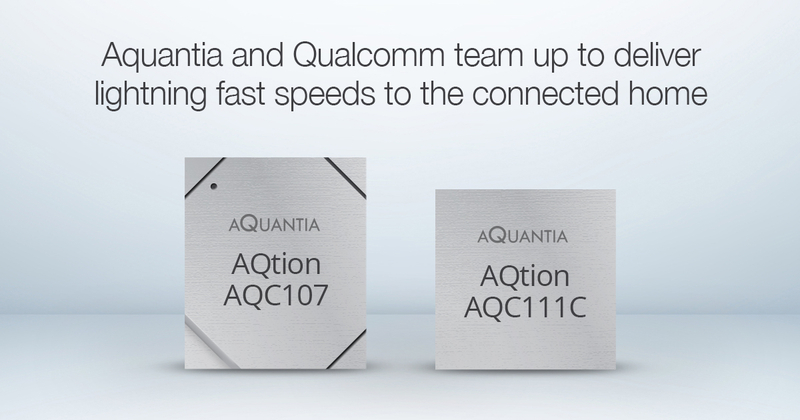 Qualcomm’s design pairs the X55 modem with the AQtion AQC107 (up to 10 GbE) or AQC111C (up to 5 GbE) wired solution, both along with the QCA6390 Wi-Fi 6 chipset, with customers free to design the systems further for power, firmware, and software. Price of the hardware, and data connections, will be carrier dependent. With the devices being focused on replacing fixed connections, there is arguably more room for stability compared to traditional mobile hotspot solutions.